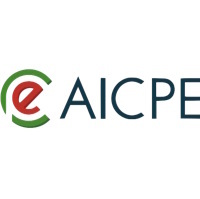 ￼Background: Although recent research on micro fat has shown the potential advantages of superficial implantation and high stem cell content, clinical applications thus far have been limited. 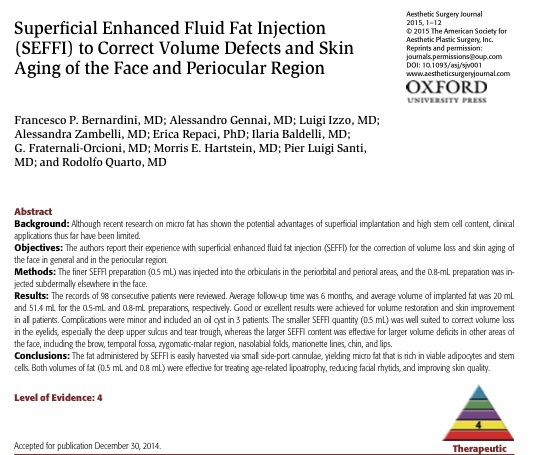 Objectives: The authors report their experience with superficial enhanced fluid fat injection (SEFFI) for the correction of volume loss and skin aging of the face in general and in the periocular region. Methods: The finer SEFFI preparation (0.5 mL) was injected into the orbicularis in the periorbital and perioral areas, and the 0.8-mL preparation was in- jected subdermally elsewhere in the face. Results: The records of 98 consecutive patients were reviewed. 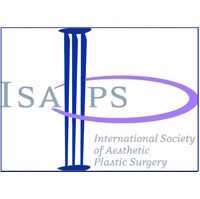 Average follow-up time was 6 months, and average volume of implanted fat was 20 mL and 51.4 mL for the 0.5-mL and 0.8-mL preparations, respectively. Good or excellent results were achieved for volume restoration and skin improvement in all patients. Complications were minor and included an oil cyst in 3 patients. The smaller SEFFI quantity (0.5 mL) was well suited to correct volume loss in the eyelids, especially the deep upper sulcus and tear trough, whereas the larger SEFFI content was effective for larger volume deficits in other areas of the face, including the brow, temporal fossa, zygomatic-malar region, nasolabial folds, marionette lines, chin, and lips. Conclusions: The fat administered by SEFFI is easily harvested via small side-port cannulae, yielding micro fat that is rich in viable adipocytes and stem cells. Both volumes of fat (0.5 mL and 0.8 mL) were effective for treating age-related lipoatrophy, reducing facial rhytids, and improving skin quality. DUBBI? DESIDERI PIÙ INFORMAZIONI? VUOI PRENOTARE UNA VISITA?